During the Joseon(i) dynasty (1392 – 1910), there developed special agencies of public opinion. They were usually called the three agencies [Samsa, 三司(ii)] because they consisted of the three agencies Saheonbu, Saganwon, and Hongmun-gwan, and collaborated with each other. The officials of the three agencies were ordinarily called official speakers [eon-gwan, 言官] because they covered institutional speech in the court. They presented their opinions to their king. As is universally known, however, the Joseon state was an absolute monarchy; the kings had absolute dignity. They were regarded as governors who were bestowed with Heaven’s decree[cheonmyeong, 天命]. Therefore, the relation between official speakers and the king was vertical. The conditions under which public discourse took place in Joseon society were not equivalent to those of modern society. In such an unequal relationship, how could it be possible for the official speakers to communicate reasonably with their king? A key to this problem exists in the characteristics of the leading class of the Joseon dynasty and its political activities; the sadaebu(iii), the leading class of the Joseon dynasty, formed public opinion [gongnon, 公論] in various ways, which was communicated in the court officially and openly. Social scientists have revealed that the public sphere was formed in the early Joseon dynasty, when the public opinion of the sadaebu influenced the real politics of the court(iv). However, this was only one of the necessary conditions to realize reasonable communication between them; the fact that the sadaebu had sufficient power and ability to form their public opinion was one thing, and the fact that communication between the representatives of public opinion(v) and the king was reasonable was another. In this paper, I pursue the rhetorical strategy that guaranteed reasonable communication between the official speakers and their king. The inherent concept of public opinion [gongnon, 公論] was formed in 14th century Korea, during the period of dynastic succession. In fact, the term gongnon had first appeared in the Goryeo dynasty (918 – 1392), but its meaning was quite abstract and idealistic. It meant ‘sound remarks’ that were unchangeable. At the beginning of the Joseon dynasty, however, public opinion was considered as a concrete opinion that was formed and communicated in a special field, the public arena [gongnonsojae, 公論所在(vi)]. The public arena was moved in accordance with the change of initiative in forming public opinion. It originally meant the State Council [Uijeongbu, 議政府], which consisted of ministries above 2nd rank(vii). However it was gradually moved to Daegan(viii) after the ruling period of King Taejong, the 3rd king of the Joseon dynasty. At the beginning of King Seongjong’s reign (1469 – 1494), the notion that Daegan was the public arena was widely accepted in court. Later, this changed once again around the 19th year of King Seongjong (1488). From that time on, the official speakers accepted the notion that Hongmun-gwan was the public arena. This change of notion had great importance, because Hongmun-gwan, by that time, had become the self-advancing path of the students [yusaeng, 儒生] into the court. So, Hongmun-gwan functioned as the channel of outer discussion [we-ui, 外議], namely the public opinion from out of the court. Finally, the public arena moved to the mountain and forest [sallim, 山林], which referred to the literati residing in the countryside (Um, 2002a). This change of notion shows the changes in the public sphere of the Joseon dynasty, which had been gradually enlarged and opened to the general reading class. By the period of King Seonjo(ix), the most important policies in the court were decided by the public opinion of the sadaebu. In the public sphere, the official speakers were regarded as the representatives of public opinion. On the other hand, the king was regarded as the representative of righteousness [gong-ui, 公義]. Gong-ui was a unique concept indicating impartial justice, which was just the opposite of private regard. It was taken to be the standard with which the king should comply. At that time, a king was regarded as a governor who was bestowed with [cheonmyeong, 天命]. Therefore, it was natural to think that a king spoke with gong-ui. For that reason, public opinion was communicated mainly between the official speakers and their king. Besides the official speakers and the king, there was another group of participants in the argumentative discourse: the ministers above 3rd rank. They discussed pending problems in response to the king’s request. The result of their deliberation was reflected in the king’s final decision. Um (2002a) suggests that argumentative discourse in the public sphere (ADIPuS) in the Joseon dynasty should be approached as a macro genre of argumentative discourse with a long historical tradition. The ancient countries under the Han civilization(x) had a long tradition of public discussion in the courts. There were three traditional macro genres of argumentative discourse in Han civilization: ju-i [奏議], joryeong [詔令], and nonbyeon [論辨]. Ju-i and joryeong were distinguished by the communication direction. The former included upward argumentative discourse genres from subject to king and the latter downward argumentative genres from king to subject. Nonbyeon, on the other hand, were classified by the ways of arguing. Each macro genre included various specific genres(xi). Many of these argumentative genres classified in the three macro genres were closely related to and crossed over each other. Accordingly, we can define that the ADIPuS was a combination of various argumentative genres in the context of the public sphere. As the examples of political debate frequently tend to be mixed in types of discourse (Walton, 1998:218), the ADIPuS was also a mixed discourse in which two types were usually combined: persuasion dialogue and deliberation dialogue. However it basically belongs to the type of persuasion, because the main stream of the argumentative dialogue was a persuasion dialogue between the official speakers and their king, and the deliberation dialogue between the ministers and the king was subsequent to the main discourse. The general goal of the ADIPuS was to resolve disagreement between arguers. Interaction in the ADIPuS began with the official speaker raising questions at issue with the king. Usually, the official speakers undertook the role of protagonist and the king the role of antagonist. Therefore the burden of proof on the top proposition was on the official speakers’ side, but they also had some advantages. In principle, the arguing activity to support their standpoint was not restricted. In many cases, the arguing of the official speakers was so persistent that it was continued repeatedly toward the king till their standpoint was accepted. According to Walton’s(1998) classification, the ADIPuS of Joseon dynasty belongs not to permissive persuasion dialogue (PPD), but to rigorous persuasion dialogue (RPD). As the characteristic of RPD is similar to critical discussion of pragma-dialectical theory, it can be said that the ADIPuS of the Joseon dynasty was a unique, historically realized form of critical discussion. The most notable characteristic of this unique argumentative dialogue was that the whole procedure of the discussion was oriented to the judge, that is the king. In such a dialogue, the ethos of the participants is extremely important. We can draw the condition of participants which guarantees reasonableness(xiii). In conclusion, it can be said that the ADIPuS during the Joseon dynasty was ‘judge-oriented critical discussion’. The consensus system is the commitment store that people in a society generally agree on. It does not need to be homogeneous, because it varies between classes, genders and so forth. However, it is clear that people in a certain communicative field hold quite stable conceptions in common, such as belief, value system, and point of view. These conceptions function as the basis of reasonable decision making. For this reason, in order to know why certain claims are accepted naturally and others are not in a certain communicative field, it is important to understand the consensus system of that communicative field. As mentioned earlier, the public sphere of the early Joseon dynasty was dominated by the sadaebu class. Therefore it is necessary to identify the core consensus system of the sadaebu. Several key terms that help to understand the consensus system of sadaebu are given below. The first key term is Heaven’s decree [cheonmyeong, 天命]. Heaven’s decree expresses the conception that Heaven bestows sovereignty on a virtuous man. If a ruler loses his virtue, Heaven moves the decree to another virtuous man. That is changing decree [hyeongmyeong, 革命]. Actually, changing decree had justified the overthrow of the Goryeo dynasty and the establishment of the Joseon dynasty. Sadaebu, at that time, thought that they undertook an initiative role in the process of the changing decree (xiv). The concept that sadaebu undertook an initiative role in changing decree developed to the concept that the subjects who spoke right words undertook a crucial role in succession of Heaven’s decree or governing the country. This was an ideology that justified the politics based on the public opinion of the sadaebu. The second key term is the virtuous [gunja, 君子] and the low [soin, 小人]. The virtuous and the low were opposing concepts that explain a conception of opposing types of human being. These concepts show that sadaebu considered Man to be bivalent and these bivalent concepts functioned as the criterion of evaluating an individual’s character. It is important to recognize that human nature was viewed as essentially equal but each person’s character could be changed through cultivating his mind. The bivalent concepts of human character were related to the thought that only a man of culture and a man of good character could participate in administrating state affairs. They thought that when the virtuous administered the affairs of state, the country became peaceful and when the low gained control over the affairs of state, the country became troubled. The bivalent concept of human character significantly contributed to preventing the country from becoming troubled by evaluating and controlling rigorously the quality of members of government. The third key term is sage-king [seong-in-gunju, 聖人君主]. The sage-king was considered as a supreme human being. It was thought that to be a sage was the condition of a king and to be a king was the way of self-realization of a sage. The concept of sage-king always reminded people of the ideal phase of kingship. The king was identified with the sage and therefore people required the actual king to possess high qualities. The selected datum in this case analysis is an article of the Annals of King Seongjong (xv). This article describes a communicative interaction (C.I.) between the official speakers and the king. This C.I. consists of Saheonbu’s prime official Yi Chik and others’ sangso(xvi), and King Seongjong’s response. It provides us with some important clues about the argumentation culture at that time. Yi Chik and others’ sangso indicates that the official speakers opposed King Seongjong’s appointment of Im Sahong. Seongjong had commanded the appointment of ‘the eldest sons of the merit subjects to posts’ in celebration of the Grand Queen Mother Insudaebi’s recovery from illness. Im Wonjun, who was Im Sahong’s father, had served Insudaebi faithfully. The official speakers had impeached Im Sahong by that time because of his abuse of government, but Seongjong had released him on his authority. Therefore the official speakers were strongly opposed to the appointment of Im Sahong. The opposing speeches succeeded stoutly and persistently. There had been 51 C.Is. from Nov. 15th to Dec. 27th, the 19th year of King Seongjong. The genres of the opposing speeches were various such as sangso, sangchaja, gye, and sangjang. Especially, the sub-genres of sangso that were used in these C.Is. changed from single sangso [單獨上疏] to joint sangso [合辭上疏], and to association sangso [合司上疏]. The official speakers finally presented resignation sangso [辭職上疏] to the king(xvii). The issues of these opposing speeches developed from a mere problem of personnel management to an impeachment and to an expostulation, the act of discussing the rights and wrongs with the king. This C.I., the 6th of these communicative interactions, was an important turning point in the arguing tone of the official speakers. Are there any clues in the C.I. to explain the reasonableness of communication between the official speakers and the king? 1. In the sangso, what were the images of addressers and the image of addressee respectively? 2. Were the statuses of addressers and addressee affected? If so, how? 3. What is the effect of changing status? There is no learned person who does not think of it deplorable, but Your Majesty does not yet realize it and would not shift His mind like a mountain. How in the world does Your Majesty sympathize with the low so extremely? Then would the Ancestors in Heaven think well of it? Would they say “how nicely my descendant holds Heaven’s will!” or say “My descendant does not abandon the great ground”? At the end of the discourse MS5, they change the status of the king to an ideal listener, a sage-king again. The king is requested to act according to the status of sage-king. Your servants have disgraced the Holy Brightness several times, but could not receive Your Majesty’s permission. Therefore it must be true that the foolish words of Your servants were discordant to the Holy Brightness. Yi Yun told Taegap that “If words are discordant to thy mind, make it a rule to seek the truth from the way.” Prostrating before, Your servants beg that Your Majesty will consider it precisely with an open mind and retrieve the command rapidly. By doing so, please eliminate the symptoms that the low ruin the country. 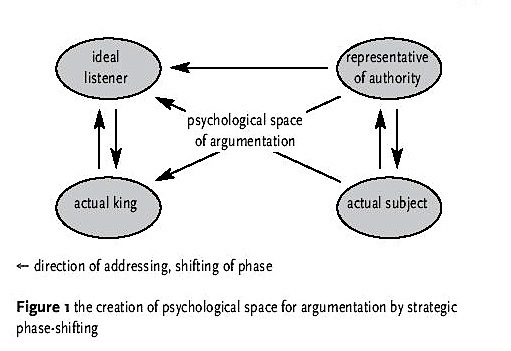 The listener’s phase has shifted from ideal listener (sage-king) to actual listener (real king) and again to ideal listener (sage-king), contributing to the creation of psychological space in which reasonable argument could be realized. It served to prevail the constraints originated from the vertical relationship between king and subject. It was possible for the official speakers to refute the negative aspects of the real listener, because the ideal model of listener, sage-king, was working as a normative model in the ADIPuS. The ideal norm of sage-king was shared between the protagonists and the antagonist in the public sphere. Therefore, it was possible for the protagonists to use the strategy of appealing to the ideal norm. 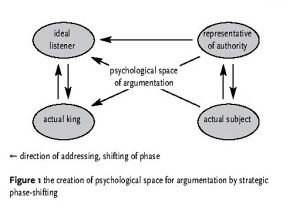 In the ADIPuS, the official speakers used the phase-shifting strategy in order to create psychological space for reasonable argumentation. This strategy was based on the public arena and the consensus system of sadaebu. The public arena was moved in accordance with the change of the initiative in forming public opinion in the sadaebu class. It was gradually enlarged and opened by the middle Joseon dynasty. It served as the substantial basis for the ADIPuS. The consensus system of sadaebu, which was based on Neo-Confucianism, offered the psycho-cultural basis of the ADIPuS. Especially, the official speakers used the conception of sage-king strategically to create psychological space for argumentation. Sometimes they spoke for the ancient sage or sage-king, and sometimes they appealed to the ideal phase of the listener, a sage-king. The phase-shifting strategy used by the official speakers appealed to the ethos of the participants. In addition, the ethos of the participants was a socio-cultural construct, consisting of a bivalent dual phase: the ideal one and the actual one. Therefore, it can be concluded that the phase-shifting strategy of the official speakers in the ADIPuS was a sort of ethos maneuvering strategy, which guaranteed reasonable argumentation between the subjects and the king. [i] From 1988, the romanization system of Korean was revised. In this paper, I followed the new system. It may seem quite unfamiliar, because the old system was used for long time. For example, the last dynasty of Korea has been transcribed as ‘Chosôn’ in most documents. But in the new system, it should be transcribed as ‘Joseon’. [ii] I juxtaposed the emic terms with the original classical Han (classical Chinese letters) if it is needed. In this example, three agencies is a translated term from the emic term Samsa. Samsa is the pronunciation of the Sino-Korean term 三司. The pronunciation and the original Han letters of the term were enclosed by [ ] as in [Samsa, 三司]. [iii] Sadaebu consisted of sa and daebu. Sa, usually translated as literati, were people mainly occupied with reading and moral culture. Sa originally referred to officials under the 4th rank in the court, but its meaning was broadened later to students who had no official careers. Daebu indicated high level bureaucrats above the 3rd rank. [iv] Jeong (1994), Choi (1986), Choi (1992) and Choi (1986). These are published in Korean. 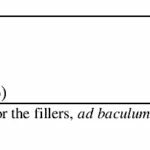 To see a more precise bibliography, refer to Um (2002a). [v] The official speakers were looked upon as the representatives of public opinion. [vi] Gongnonsojae was a kind of emic term indicating the political public sphere of the Joseon dynasty (Um, 2002a). [vii] There were 9 ranks in the Joseon bureaucracy. [viii] Daegan refers to Saheonbu and Saganwon. [ix] The 14th king of the Joseon dynasty, reigning from 1567 to 1608. [x] Han civilization refers to the cultures of East Asia, which were developed on the basis of a common written language [漢文]. Han civilization includes China, Korea, Japan and Vietnam. Han is the name of the common written language of medieval East Asia. The common written language in East Asia[漢文] has been translated as ‘classical Chinese’ in English, but the term “Chinese” is inadequate and leads to misunderstanding. The classical texts of [漢文], when read with Vietnamese, Korean, and Japanese pronunciation, are not intelligible to the Chinese. Visually, the common classical language of East Asia confirms the unity of a civilization, but orally, its various different pronunciations indicate its diversity. From these aspects, the term “Han” was suggested as the name of the common classical written language. The “Han” is an abridged sound form of the common written term of [漢文] used by all three countries, hanvan (in Vietnamese), hanmun (in Korea), kanbun (in Japanese). The Chinese also used the term hanwen, but it means something different: Han dynasty prose. But by majority rule, the Chinese term loses its qualification as the standard. See Cho (2000), 159-60. [xi] Ju-i consisted of sangso [上疏], sangchaja [上箚子], sangjang [上狀], gye [啓], etc; joryeong consisted of jeongyo [傳敎], gomun [顧問], myeongso [命召], bidap [批答], haeoseo [下御書], etc; nonbyeon consisted of ui [議], seol [說], byeon [辨], etc. [xii] Um(2002c: chap.4) shows in a case study that the judge’s decision was made according to whether the top proposition was proved by the protagonist or not. [xiii] I have suggested the condition of judge and the condition of arguers of the ADIPuS. Refer to Um(2002c), chap.4. [xiv] See the Annals of Taejo, September 17th, the 1st year of Taejo (1392). The Annals of King Seongjong form parts of the Annals of the Joseon Dynasty. These xv. Annals record historical facts about 25 kings over 472 years day by day. UNESCO registered them as part of World Documentary Heritage in 1997. To receive more information about them, refer to the following web site: http://www.unesco.org/webworld/mdm/1997/eng/korea_choson/koreanom.html Seongjong was the 9th king of the Joseon dynasty. During his reign, the institutional system of the Joseon dynasty was established. [xvi] Sangso was a kind of communicative act presented to a king in the form of a formal letter. It also referred to one of the letter genres presented to a king, a kind of memorial. [xvii] These terms were used conventionally at that time to classify the sub-types of Sangso. [xviii] Move succession is a useful unit for analyzing written discourse. In this research, communication with written discourse is defined as monological dialogue. Move succession is a unity in which more than two moves cohere with the same sub-topic. Move succession is a redefined term of the conventional text unit paragraph in the perspective of dialogue. [xix] For example, at the 5th move of MS2, the scheme of argumentation from authority was used. At the 3rd move of MS3, the scheme of a thing and its attributes was used. In MS4, the scheme of cause and effect was used. And in MS5, the scheme of argumentation from authority and the scheme of argumentation by analogy were used. The classification of argumentation scheme is based on that of Perelman & Olbrechts-Tyteca(1969). [xxi] The name of the Ancestral Temple. It symbolizes the legitimacy of the dynasty. Jongmyo, of the Joseon dynasty, is the oldest and most authentic of the Confucian royal shrines that have been preserved. It is consecrated to the forefathers of the Joseon dynasty(1392-1910). [xxii] The guardian deities of the State. Sajik symbolize the State. [xxiii] Yi Yun was a famous Minister of State who helped the holy King Tang [湯]. Taegap was the grandson of Tang. He succeeded Tang. [xxiv] This passage is quoted from the Book of History. When Taegap succeeded to the throne, he did not govern well. So Yi Yun had expelled him from the throne for a while and confined him to a distant palace. Taegap regretted his past error deeply there and became a great king. The volume from which this passage is quoted was the admonition of Yi Yun to Taegap. Cho D. (2000), Historical changes in the translation from Chinese literature: a comparative study of Korean, Japanese and Vietnamese cases. Reconstructing cultural memory: translation, scripts, literacy. vol. 7 of the proceedings of the xvth congress of the international comparative literature association “Literature as Cultural Memory”, 155-64. Hall, D. L., & R. T. Ames (1987). Thinking through Confucius. Albany: State Univ., New York Press. Jensen, J. V. (1992). Values and practices in Asian argumentation. Argumentation and Advocacy, 28, 153-166. Oliver, R. T. (1971). Communication and culture in ancient India and China. Syracuse: Syracuse Univ. Press. Um H. (2000). Joseon Seongjong-dae toronmunhwa yeon-gu (A study of the culture of debate in the reign of King Seongjong in Joseon dynasty). Korean Education, 103, 269-313. Um H. (2002a). Joseon-sidae gonron yeong-yeok nonbyeone daehan genre-ronjeok jeobgeun (A generic approach to the argumentative dialogue in the public sphere of the Joseon dynasty). Korean Language Education Research, 14, 283-313. Um H. (2002b). Joseon jeon-gi gonron yeong-yeok nonbyeone sare bunseok (A case analysis for the argumentative dialogue in the public sphere in the early Joseon dynasty). Textlinguistics, 12, 69-92. Um H. (2002c). Joseon Jeongi gongron nonbyeon-ui gugeo gyoyukjeok yeon-gu (Study on public argumentative dialogue in the early Joseon dynasty – from an educational perspective). Unpublished Ph.D thesis, Seoul National University. Van Eemeren, F. H., R. Grootendorst, S. Jackson, & S. Jacobs (1993). Reconstructing Argumentative Discourse. The University of Alabama Press. Walton, D. N.(1998). The New Rhetoric: Conversational Contexts of Argument. University of Toronto Press. Yum, J. O.(1988). The impact of Confucianism on interpersonal relationships and communication patterns in East Asia. Communication Monographs, 55, 374-388. ISSA Proceedings 2002 – Evaluation Of Secondary Students’ Written Argumentations. Problems And Proposal Of An Evaluation Procedure.